Mushrooms were not a big part of my life, growing up. At least, the beautifully packaged ones weren't. 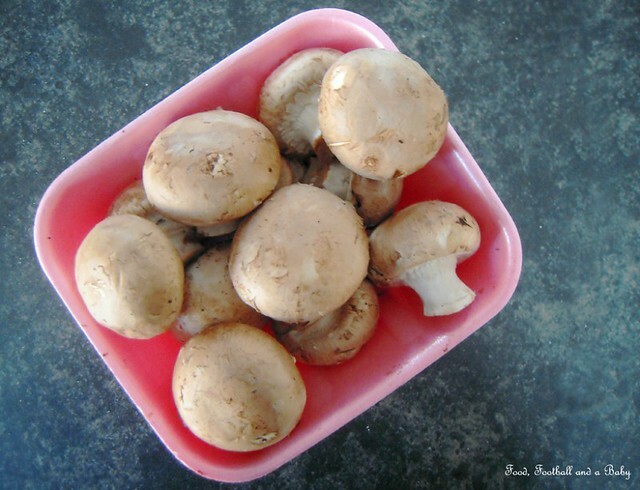 The mushrooms that we had were foraged by us, especially right after the monsoons, when the forests were overflowing with them. My grandparents (Mai and Aba) live in a little village outside Mangalore called Karkal, and they have a considerable amount of land, and quite a bit of it is (and hopefully will continue to remain) forested. These 'padi' or forests were a source of endless joy to us as kids, and we loved roaming through them all the time, collecting cashew nuts, mangoes and binda (kokum fruit) during the summer and mushrooms (called 'almi' in Konkani) and kookan (a sort of Jerusalem artichoke, but smaller) during monsoons. Everything depended on the season, and of course, the freshness of the fruit and vegetables was a given. Back at Mai's we piled the mushrooms into the big stone sink, and either my mum or my aunt would get to work, sorting through and cleaning up the edible ones. Pretty much 99% of the mushrooms we picked were edible, but occasionally we would come across an unidentified one that would be chucked away (these were the days before internet, we couldn't handily look up edible mushrooms, hehe) Once the mushrooms were cleaned and sorted, depending on the size of the haul, some would be passed on to the neighbours and the rest would be very simply cooked in the 'tel - piaow' (oil - onion) style of cooking. This style is probably the simplest of Indian cooking. But don't be taken in by the simplicity, the flavours packed a real punch, with the earthiness of the mushrooms and their unique taste showcased beautifully in the delicately spiced dish. We were served the dish at lunchtime with a simple congee and homemade lime or mango pickle. This, for me, is comfort food at its best, and I miss those easy, carefree and happy days with my little cousins and family. And the point is the challenge that Mushrooms Canada threw out to us, Canadian food bloggers. The brief was to make a festive recipe using mushrooms. Of course, my brain started working overtime, as soon as I heard the words 'festive' and 'mushrooms', especially as Kay and Aditi don't eat meat and I have to come up with a vegetarian alternative for Christmas dinner. This year we've decided to spend it here in Edmonton, and with just the three of us, its going to be a challenge to make sure we celebrate Christmas in a way that Aditi will remember. So I put on my thinking cap, and armed with my trusty notebook, started to work on this recipe. I have already blogged about the various Christmas traditions that we used to have as kids growing up in India, and also have been wildly experimenting with fusion-ey recipes. So, I knew I that wanted to make a Indian/ Canadian fusion recipe almost as soon as I read about the challenge. And that I wanted to use ingredients that were readily available (I don't do last minute Christmas grocery shopping, shudder!) So I first picked out puff pastry (I made salmon en croute for last years Christmas dinner), as I wanted the dish to be rich and buttery and for me, nothing spells festive more than a beautiful puff pastry tart or en croute. I also knew that I was going to spice up the mushrooms with Indian spices, so that was settled in my mind. I then thought about how to present these two elements together, and my first attempt at creating a recipe was a collection of cute spiced mushroom and puff pastry tarts. I liked the combination, but felt that something was missing. So, for my second attempt, I added fresh herbs to the little pastry cases. Worked better this time round, but still not quite there. And then, inspiration struck in the form of my dear mum. I went back to my Indian Christmas recipes, and found the missing link. 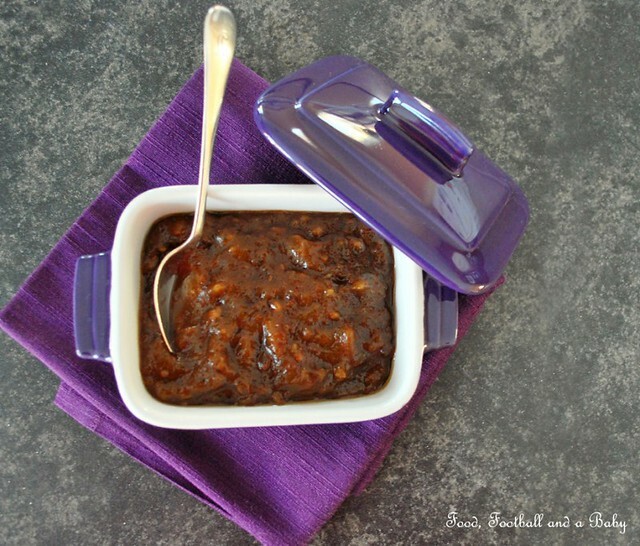 Date chutney, also very weirdly known as plum chutney. This chutney is a classic accompaniment to the Mangalorean sweet pulao rice which is served with a spicy chicken or pork curry during festivals. The more I thought about it, the more I was convinced that this would be the combination that worked. Also, by this point I was getting fed up of making the pastry cases, so I decided to go big and bold and make a puff pastry braid instead. And then I had another 'festive' idea. I thought that the pastry braid needed a bit of crunch and texture, so I toasted up a few pecans and scattered them on top of the chutney and spiced mushroom filling. The result was amazing. I wish I could have a 'taste' button for my blog sometimes, as I always want to share the actual depths of flavour that some of these dishes have. Sadly, as that button hasn't been invented yet, I have to make do with just words instead. The dish was exactly what I had imagined it would be. The mushrooms were delicately, but not overwhelmingly so, spicy, with the fresh bright taste of the herbs accentuating, but also mellowing down the spice. Every bite elicited a deep earthiness from the mushrooms along with the spicy-sweetness of the chutney, and the light crunchiness of the toasted pecans. The flavours just exploded in the mouth, each distinct from the other, yet coming together in a harmonious whole. 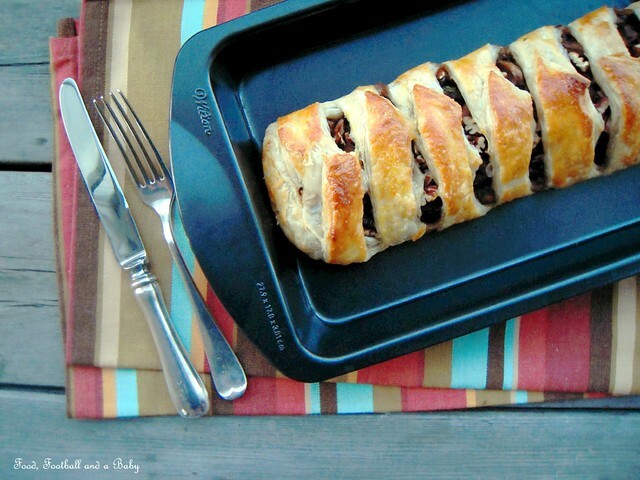 I loved this dish, because for me, this symbolised every element of Christmas, from the rich sticky festive date chutney from my mum, to the pecans that always come out in a big bowl at my in-laws, to the spiced mushrooms that encompassed the diets of my husband and daughter, to the rich buttery pastry that I love. And I loved that I am able to infuse all the cultures that I have lived in into this one dish, and for me, that makes it very special indeed. I sure hope that you will enjoy it too! Make the date chutney, recipe here. Keep aside. Heat the 1 tablespoon oil in a pan, and saute the onions, till soft and golden, about 7 - 10 minutes. Add the ginger and stir for an additional 30 seconds. In a smaller pan, add the 2 teaspoons of oil, and saute the chilli powder, garam masala, cinnamon and nutmeg for 1 - 2 minutes, stirring all the time. This will take away any rawness in the spices. Add the fried spices to the onion-ginger mixture, and saute for about 1 minute more. Add salt. Slice the mushrooms thickly, and add to the onion mixture. Cook for about 10 minutes on a medium high heat, until the mushrooms are tender. They will release their juices, so if the masala is too watery, turn up the heat and boil away any excess water. The mixture should be moist, but not watery. Taste and adjust seasoning. Take off heat, and let cool completely. 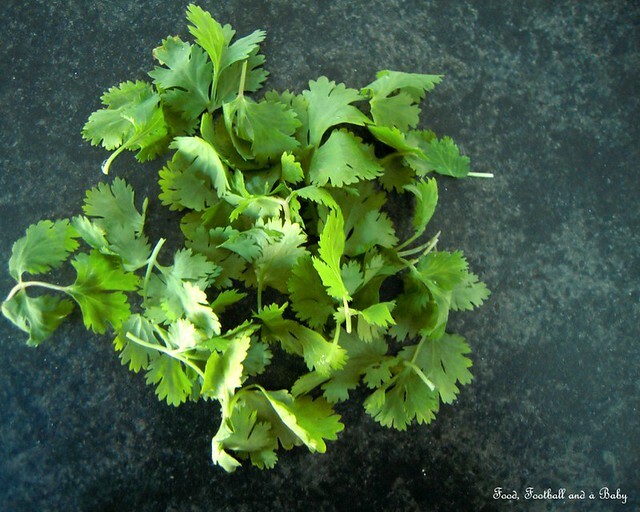 Stir in the fresh coriander and mint. Leave to go cold. 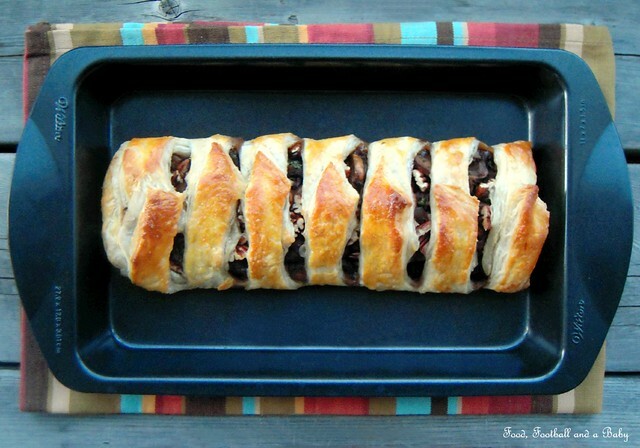 While the mushrooms are cooling, preheat the oven to 400 F.
Roll out the puff pastry to about 30 cm by 22 cm rectangle. 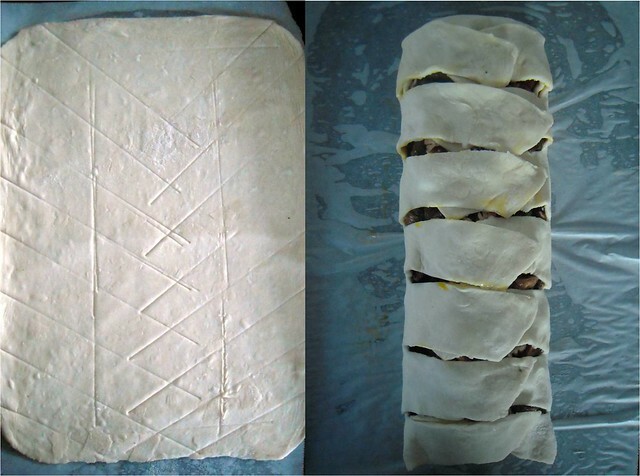 Using a ruler or similar, gently mark out thirds lengthwise in the pastry. This will help you figure out where the filling goes (the two pictures below the recipe will help). Gently smear the chutney in the middle third of the pastry rectangle. Top with the spiced mushrooms, then sprinkle over the taoasted pecans. Then cut the side wings of the pastry into 1 inch strips at an angle, like left side of a V. Again, refer to picture below to help. Fold the top and bottom edges of the pastry over the filling. The brush the sides of pastry with the beaten egg, and gently fold the angled strips over the filling, like a braid or a plait, brushing with more egg to seal. Once the braid is done, brush over more egg wash on top, and place in the oven. Bake for 20 - 25 minutes, checking every so often, until the pastry is golden. Gently slide on to a serving plate, and let cool a little. Cut into slices to serve. Goes brilliantly with a simple side salad, as well as part of a larger festive dinner. If you prefer, you can make smaller puffs instead of the braid, and serve as appetizers as well. Note: I always like to give credit where its due. So, while this recipe is original, the technique of braiding was inspired by the Tenderflake recipe for brie, pear and walnut tart. And it sounds very interesting! Thanks Redawna, looking forward to seeing your recipe. This looks spectacular! I wish you had a smell button on your blog (in addition to the taste button) - imagining the aromas as you slice this open has my mouth watering - and its only breakfast here. Definitely on my 'to try' list. What a coincidence, Michelle! I enjoyed reading your childhood experiences a lot! You have written it so beautifully. Also like the idea of mushrooms enclosed in puff pastry. I wish we got vegan butter here, then maybe I could try this. It reminds of quiche! this is absolutely delish.. plum sugar is new to me.. where can i find it in US? Nicola, thank you. It was a hodge podge of recipes, but the end result was just yummy. Harini, thank you. I can only aspire to reach your level, but I am learning every day and I look up to bloggers like you who generously share recipes and tips. 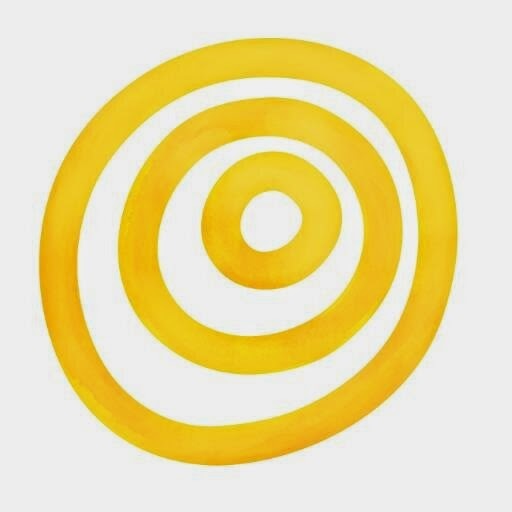 My husband and daughter are vegetarian, and I use your blog as a huge resource. Indulge, thanks. 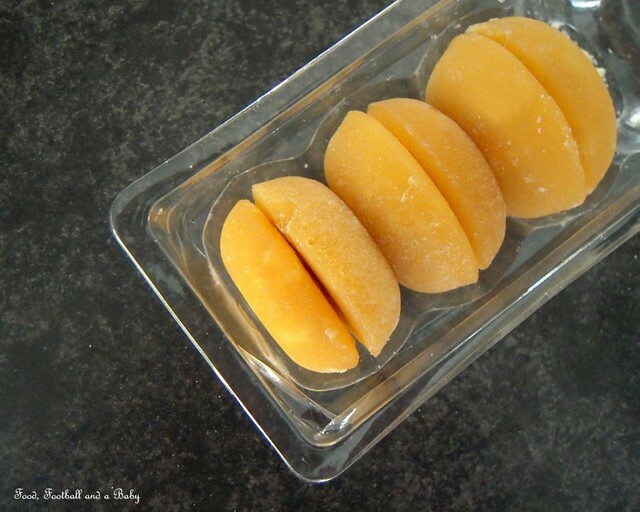 Its actually Palm Sugar, also known as Jaggery, but a little lighter. You should be able to find it in any ethnic store, esepcially Thai or Indian. Rach, thank you, much appreciated. Brittany, cheers! It was a great challenge and I can't wait to see what other bloggers come up with. Fingers crossed for me too ;-) If you invent a taste button you have my undying gratitude. Its weird, but I never thought of mushrooms as a festive dish, but then realised that almost every Christmas dinner, I've made a vegetarian version and its had mushrooms in it. Michelle this is a stunning post - both in words and pictures. I LOVE the idea of this dish and it really does bring out the festiveness of mushrooms. Gorgeous!